A few days ago I told you about the book I was making for my neighbor with picture of the cats in our neighborhood. I ordered a copy to see what it looked like in person and I have to say I'm really happy with it. You can take a look at it by clicking on the arrow below. I am going to be selling it at the craft fairs the rest of this year to see if I can make some money for the Hawaii Island Humane Society. I will be ordering a bunch of them so that I can save everyone on the shipping costs, which are quite high if you order it yourself from Blurb.com. The size is 7x7". It's 32 pages long and it's available in softcover or hardcover. The price for the softcover is $15.00 including shipping if you purchase it from me. The hardcover book with a dust jacket is $25.95. For each book I sell, I will donate $3 to Hawaii Island Humane Society in Waimea. The rest is the cost I have to pay to have it printed. 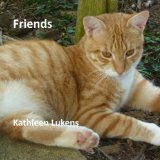 But even if you don't want to purchase it, take a look at it -- if you're a cat lover I think you'll enjoy the pictures. And it might give you an idea of what you can do with your own pictures. I'm now in the process of writing a book on How to Wear Scarves -- I'm hoping to finish it up this week and order my preview copy. i love those kitty faces even the ones i did not meet last summer which would be most. did i see Smuge face at the end? Kathy, this should be a hit at your shows and that it helps animals in your area, even richer the good.